MINOR WEAR ON SOLES AND LEATHER LOOKS GOOD WITH DISTRESSED AREAS(PICTURED). 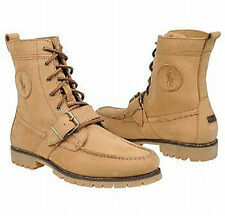 Original Ralph Lauren Boot. Color: Black. These are in great vintage condition. There are no holes or stains just a little worn. Please see pictures for better description. Feel free to ask any questions and check out the rest of the clothing. Thank you! These classic books are in good condition - only exception being there is a condition issue to the top stitching on the left boot -see photo for complete details. 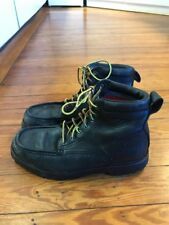 Awesome boots in great shape. We are happy to get a quote for you if you so desire. We try very hard to give accurate details. I am usually much harder on an item than is necessary, describing every minute flaw, because I want you to be happy when you get it ! 10 1/2" insole length, 12" outsole length, 4 1/4" width at the widest. Thick threaded rubber out-sole and heel for superior traction. 12" shaft height. POLO RALPH LAUREN TEAM USA 2010 OLYMPIC BOOTS mens 10.5 NEW RARE MUST HAVE !!! !